The HandPunch® GT-400 brings the flexibility of a full-function time and attendance terminal together with the sophistication of the most robust verification technology available. 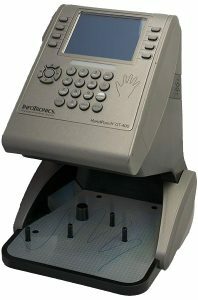 To eliminate employees from punching in for one another, the HandPunch GT-400 uses the size and shape of your employee’s hand to verify their identity each time they punch. No fingerprints or palm prints are utilized ensuring the privacy of each user. A cost-saving, easy-to-use solution. With the HandPunch GT-400, your hand is your badge. The cost of creating and administering badges is eliminated along with buddy punching (when one employee clocks in for another). The system ensures payroll accuracy by simply requiring each employee to be there to punch. The terminal is fast and easy for anyone to use.